Okinawan Spinach is a vegetable that grows in sub-tropical climate. It can easily be grown in a pot or a container, as it is a fast growing dense, non-vining shrub. 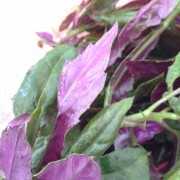 It has edible leaves that are shiny green above and a beautiful purple below. The plant is a very good friend to butterflies in Hawaii and can act as a host to the Kamehameha butterfly. It is often grown and eaten for its medicinal properties as it is thought to lower cholesterol. It also contains a good amount of vitamin A and protein. – Always wash and dry your Okinawan spinach well before eating. – It is most often eaten raw – added to sandwiches, salads, pizzas. – When cooked it can take on a slightly slimy consistency (that’s good for you!) so most often it is cooked with other leafy greens. – It can also be added to soups and stews. For best eating harvest/select tender shoots and leaves. Store in the refrigerator unwashed in bag or sealed container for up to 4 days. Okinawan Spinach can be easily propagated through cuttings and grown in containers. They do best when consistently harvested (pluck leaves and eat daily).